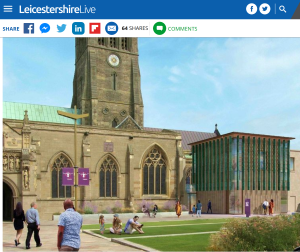 The cathedral’s ambition to carry out a wide-ranging £11.3 million revamp of the Grade II* listed historic building is set to be approved, but Historic England has concerns. The cathedral says it needs to make major changes to preserve the cathedral’s primary as a place of worship while accommodating increasing numbers of visitors drawn to the tomb of Richard III. The planners say it will not detract from the landmark nature of the St Martin’s cathedral. Heritage watchdog Historic England disagrees entirely saying the proposal will cause harm to the significance of the cathedral and not make a positive contribution to the surrounding conservation area… Historic England says it is concerned about the proposed use of green and blue terracotta in the design and have suggested that without alterations the harm caused by the scheme will outweigh the public benefits. The council’s own conservation advisory panel has described parts of the proposed design as ‘crude.’ The cathedral has removed planned solar panels on the cathedral roof from the scheme after receiving the representation of Historic England. The cathedral has said: ‘The replacement of the Old Song School by the Heritage Learning Centre changes the cathedral and its setting. We do not think the change is detrimental to the overall cathedral or harmful to the setting or precinct. Together these proposals will allow everyone who comes to the cathedral to enjoy its beauty, understand its history and appreciate its heritage.’ The granting of planning permission is required if a bid for Heritage Lottery cash, essential for the scheme to proceed, is to be successful.